This is an algal dispersal unit collected in an outdoor air sample in a suburban environment. 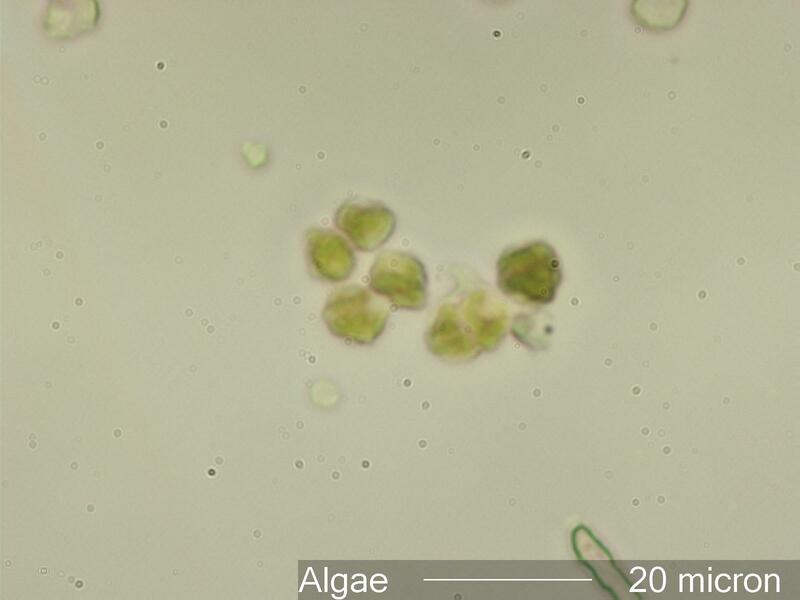 Algae is often found in both air and surface samples indoors, though always at very low levels. It is typically seen as "dispersal units", collections of multiple individual cells. Parts of the cells show some anisotropy and are visible with full crossed polarized light. The green color of the chlorophyll is evident in these cells. Diatoms are also algae but they are presented separately because they are distinguished by their unique morphology. Algae become part of the outdoor aerosol by splashes due to rain drops on the ground or on the water surface, by wave action, or by wind. Algae populate bodies of water, the soil, bark of trees and shrubs, and may other surfaces. Lichens are a symbiotic blend of a fungus and an alga. Under very moist conditions the alga partner may dominate and release alga dispersal units rather than the fungal spores. Lichen may also release "soredia", bundles of algal cells associated with hyphal fragments as propagules (propagation units). The algae that form siliceous structures, diatoms, are present in the environment from construction materials (diatomaceous earth additives), from dried ponds on open terrain or on flat roofs, and from all of the sources mentioned above. They are discussed in more detail under their own category, Diatoms. Brodo, Irwin M., Sylvia Duran Sharnoff, and Stephen Sharnoff, LICHENS OF NORTH AMERICA, Yale University Press, pp. 30-1, 2001.